Haridwar: Bringing forward the glaring shortage of medical practitioners in the country, is an example of one Haridwar Hospital, which while being a 100-bedded facility is manned by only one Doctor. A recent report in TOI focuses on the story of Mela hospital at Haridwar, which was created as a permanent asset with funds made available during the 1998 Kumbh mela, and is operating with a single doctor. The hospital was set up as a 100 bedded facility in 2003, with an intention to support the district hospital in Haridwar and reducing its load of local as well as the visiting population. It was equipped with the latest machinery including pathology laboratory, ultra sound and x-ray units, ECG and intensive care unit. Unfortunately, Manpower soon became the achillees heel of the hospital, with currently only one doctor manning the facility. Dr H K Singh, a skin specialist, is the lone doctor at the 100-bedded hospital which has sanctioned posts of 15 doctors, reports TOI. With only one doctor left at the facility and uncertain future on hiring, OPD at the hospital are estimated 150-200 patients a day, down from a number of 700-800, in the early days of operation of the hospital. No admissions take place, and the lone soldier, Dr HK Singh tends to all kinds of patients at the hospital. I don\’t think that shortage of doctors is the reason. 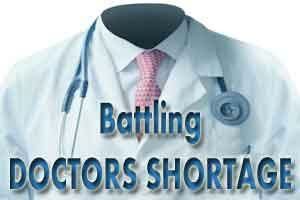 The real reason must be unwillingness of Govt to recruit doctors. Not true, doctors have the ability to choose between A govt and private job. Life is better for private doctors so they do not go for govt jobs. Just one doctor in govt hospital but quite a lot in private practice. Overall of course India is very very short of properly qualified medics indeed! It is rather surprising that we as Doctors are not interested in introspecting. How can one justify lack of trained manpower?? We are neither willing to abide by the law nor are we allowing others to do the needful. Let us be the responsible role models for a change before condemning the system!! Hang his photo and mobile no on the wall and then this one will also runaway . I feel the Govt is not interested in running the hospitals . Their approach shows that they are more interested in closure of the hospitals . Keep imposing new unethical rules on medical fraternity. This hospital will soon run by quacks or somebody else.